Microsoft discontinued its freeware email client Windows Live Mail in 2014 and replaced it with Outlook.com. In 2016, Microsoft announced that Outlook.com was discontinuing its support for Windows Live Mail. This article remains here for archival purposes. The magic at a photo exposition's premiere night is, of course, in the photos—and it's brought out expertly by the ambiance and light, framing and arrangement, food and hosts. Likewise, you can send your last hike's photos as attachments, or you make them shine with a smart arrangement that uses lighting and framing. 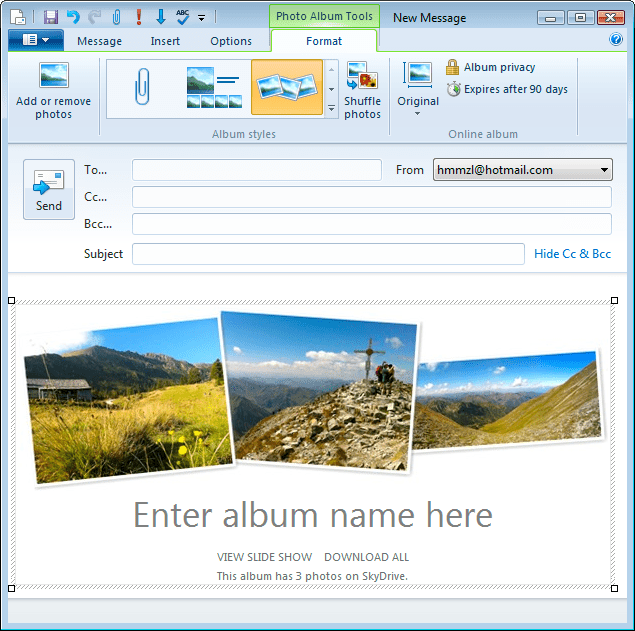 Windows Live Mail can host your photo exposition: It offers album options, uploads the high-resolution photos to SkyDrive for full viewing, and includes a neatly formatted album preview in the email, too. Open the Home ribbon in Windows Live Mail. Find and highlight all the pictures you want to add to your gallery. You can add more photos, from a different folder for example, later. Click Shuffle photos to rearrange your pictures. Note that you cannot drag and drop photos to change their order. Pick a different album format under Album styles. Click Album privacy to make your online SkyDrive album available for anybody to see or restrict viewing to email recipients. Use the Photo upload size button to choose the resolution of the photos online. Photos in the email are always be downsized to fit size constraints. To add more photos, click Add or remove photos > Add photos and pick new photos for your gallery. Click OK.
To remove photos, click Add or remove photos and highlight the images you want to remove from your gallery. Click Remove photos. Click OK.
Continue composing your message and then send it. You can also send images inline with Windows Live Mail without having them arranged in a gallery.